The next 16 months will be busy for Milwaukee as it prepares for the 2020 Democratic National Convention. TODAY'S TMJ4's Charles Benson talked with Mayor Tom Barrett while touring downtown on The Hop about the challenges and the opportunities for the city and state. 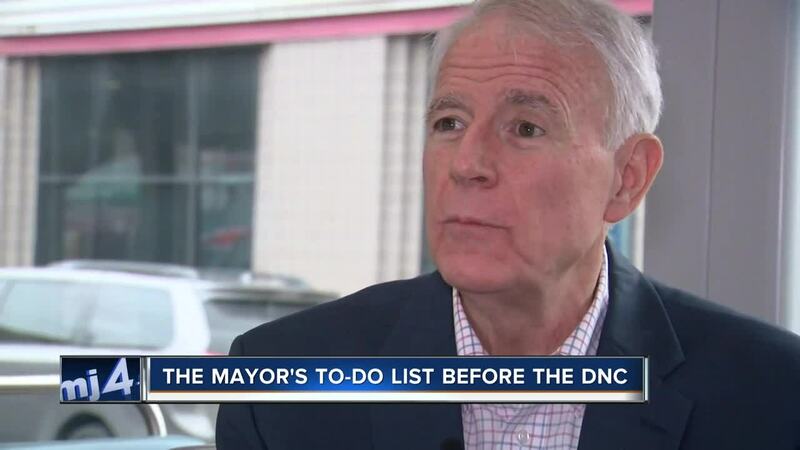 Mayor Barrett has a lot on his plate these days as the city prepares to host 50,000 visitors for the Democratic National Convention at Fiserv Forum. That includes nearly 5,000 delegates using The Hop and attending up to 1,500 events. Barrett: They spend a lot of time in meetings and having food. and some drinking, but actually more the meetings and the food are the two areas where you are going to see a lot of activity centered right here in the heart of the city. Benson: So what do you see when we go by here? Barrett: We're going to go past the Public Market - the Public Market is going to be packed. Hotels will also be packed, leaving opportunities for other options. "I think whether its Airbnb, weather it's a bed and breakfast, whether it's people who want to rent their homes," said Barrett, "I think there is going to be a real opportunity to do that." The Mayor knows the national media spotlight will be on Milwaukee and with that comes scrutiny. "It allows us to put more effort, more partners, to enhance the great things, but also to address some of the challenges: The poverty challenges, employment challenges some of the housing challenges," said Barrett. Benson: What would you say to folks who live and work in Milwaukee - do they need to be ambassadors that week? Barrett: I'm looking for 12,000 of my closest friends. Benson: You've got 4,000 already. "This without sounding like hyperbole - this could be a once-in-a-lifetime opportunity, lets use it and showcase our community," Barrett said.